As a reporter, Stephen Crane often covered stories in New York’s Lower East Side. The squalid tenements and shocking poverty left a lasting impression on Crane. 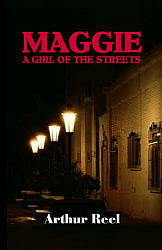 With Maggie, A Girl of the Streets, Crane sought to render realistic portrayals of the people he encountered there. Crane completed Maggie in 1893 but could not find a publisher for the novel, since its subject matter was deemed to be inappropriate for readers. Crane self-published the novel in 1893. Then in 1896 with the success of The Red Badge of Courage, a revised version of Maggie was finally published.